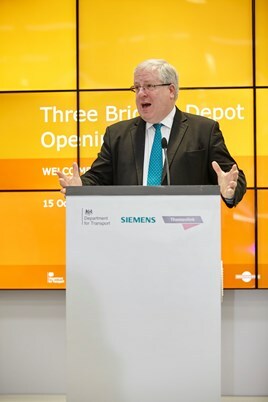 Secretary of State for Transport Patrick McLoughlin formally opened Siemens’ new Three Bridges train depot in West Sussex on October 15. The opening marks a major milestone for the £6.5 billion Thameslink programme. The depot, which is home to two new Class 700 Desiro City trains, will house and maintain the new fleet of Govia Thameslink Railway trains operating on the Thameslink network (RAIL 774). Three Bridges depot, along with a similar train care centre being built in Hornsey, was constructed by VolkerFitzpatrick at a cost of over £300 million. Hornsey is on track to be completed in July 2016. Three Bridges is fully signalled and incorporates key personnel safety features including a depot protection and emergency electrical isolation system. It has an automatic inspection facility, which uses laser measurement to accurately predict when components need to be fixed or replaced. Other features include an in-cab simulator that will provide specialist training to drive a new Class 700 train. There will be a combined total of approximately 150 jobs based at Three Bridges, with 1.4 million man hours already accumulated during the construction phase. Hornsey Depot which is still under construction should be opened early next year with the Siemens Class 700 Desiro City trains to be delivered to both Three Bridges and Hornsey Depots and also to be stored at other depots & sidings including Brighton and Bedford.